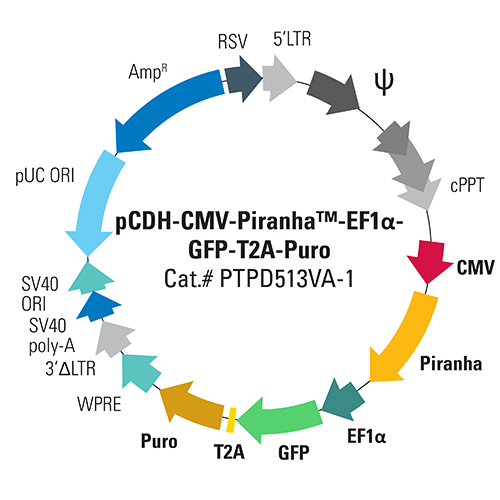 With SBI’s pCDH-CMV-Piranha™-EF1-GFP-T2A-Puro Pre-pacakged Lentivirus, you can build your own cell line constitutively expressing the Piranha Targeted Protein Degradation System. In this ready-to-transduce lentivirus, the Piranha protein is expressed from the strong CMV promoter and the construct is marked with GFP and puromycin. To initiate targeted protein degradation in your Piranha-expressing cell line, simply electroporate in antibody specific for your protein-of-interest—you’ll start seeing degradation of the protein-of-interest in as little as 1 hour*.